180 degrees of coverage, without the distraction of seams or traditional type sideshields. This almost frameless design creates a spectacle that weighs only 27 grams per pair. The Venture II also introduces our special nose-buds that secure the glass to your face without slipping, while providing a pillow soft fit. Fully adjustable temples-4 different size settings. The Rendezvous adapts to accommodate a broad range of facial sizes. Align the angle of the lens to the proper position for your work application with ratcheting lens pitch adjustment. The flexible nylon temples have four size settings enabling each wearer an individual, comfortable fit. Looks lighter than air - feels lighter than air. The rendezvous floats on the face for weightless all day wear. Being cool means staying cool. 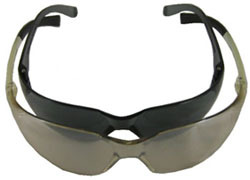 •Intrepid features fully adjustable temples, soft non-slip rubber nose piece for a cushion fit. 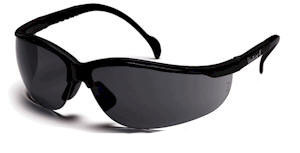 •Provides 100% protection from harmful UV rays. •ANSI Z-87 Certified. The Mini-Ztek has all of the same great features as the standard size Ztek but in a smaller size. It fits nicely on women, children, and small adults. 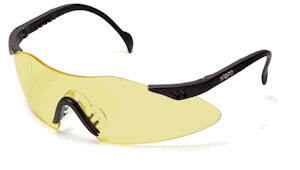 It's hard to beat the comfort, price, and stylishness of this women's safety glass. •Sporty design delivers reliable performance. •Nose buds prevent slipping and provide a cushion fit. •Fashionable straight back temples feature soft pliable tips. •Lenses are coated for superior scratch resistance. 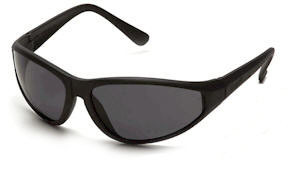 •Lenses provide 99% protection against harmful UV rays. 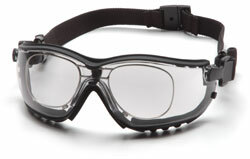 The V2G safety glasses now have a prescription insert option. The RX inserts easily clip into the existing V2G goggles and can be interchanged with all the V2G standard goggles and their lens tints. The V2G Goggles are sold separately. RX lenses will need to be fitted from your local Optometrist.